Cruising Woodward in a Flxible or an Airstream? We say Flxible by a nose, given that nose is loaded with retro-futurist charm. Plus as a side benefit you get to constantly explain why there's a missing "e" in the name. By the way, that weirdly-spelled name is due to someone else holding the "Flexible" trademark. 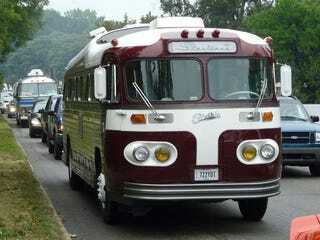 No matter, the company built some of the coolest motor homes and coaches of the era. This one's been dutifully making the rounds since Thursday. We'd hate to see that fuel bill.